Sometimes, the less you have to say about a young horse the better, as that usually means he had no bad habits. When he was at Fair Hill last year, Bruce Jackson said he had a great temperament, was very straightforward and willing, his works were impressive, and he did everything very easily. In fact, he was training so well, McGaughey decided to just run him at Laurel while he was down there and he blew his field away in the slop going six furlongs. And we all know what he’s done since, even though he still hasn’t run in a stakes. He had his first work since his allowance score, breezing a half in :49 1/5 Saturday at Payson Park. His No. 1 ranking is based purely on potential and visual assessment, as he does not possess anything close to the credentials of those directly below him, and his speed figures, both Beyer and Thoro-Graph, need to improve. Two weeks down and seven weeks to go before we see him again. What he has going in his favor is McLaughlin’s ability to get a fresh horse ready for a big race, as well as the foundation he built and the battle test he was put through in the Remsen Stakes. Although he did allow Honor Code to come back and beat him after apparently having gotten the better of him, we at least know he won’t back down from a fight, and he does have the ability to deliver a knockout punch, as he did in the Holy Bull. As for his minimal campaign and passing the Fountain of Youth, welcome to the world of the speed sheets and the fear of peaking too early in the year. What I loved most about his effort in the Robert Lewis was how he willingly eased back on the turn and moved to the outside, and the way he covered ground down the stretch with that huge, flowing stride, winning under a confident ride, while tossing his ears back and forth. He was a powerhouse galloping out way ahead of the others and just kept going until Stevens finally got him to the outside fence and was able to pull him up well down the backstretch. Stevens said the colt didn’t even take a deep breath and called him “a super talent.” He has such a high cruising speed, Stevens was extremely surprised when he saw how fast the final time was. He has the physical appearance of a horse who will relish the longer distances, and runs like it. Loved the way he sat comfortably off a quick pace, while rattling off quarters in :23 3/5, :23 2/5, and :23 4/5, then came home fast in :24 3/5 and :06 1/5, and kept on going. And we’ve already witnessed his rapid-fire acceleration with that mind-blowing middle move in the CashCall Futurity. We’ll see if the move to Gulfstream from the deep, testing surface at Payson Park will help get him back on course. McGaughey needs to get two solid starts in him, and the question is, will he be ready for the March 1 Gotham or wait a week for the Tampa Derby? It would seem finding an allowance race would be a longshot. You never like to see any physical setbacks, regardless how minor they are, but he does have the Remsen and Champagne foundation to fall back on. And he is a very talented and versatile horse with a monster stretch kick if he needs to use it. Back in training after having his quarter crack patched and should be back breezing after several days of galloping. Until we see him progressing on a daily basis, we’ll keep him here. Once he’s back in his routine and doing well, he’ll return at or near the top. It was just difficult keeping him in the Top 3 week after week when there was nothing to say about him and no news coming from his camp. He is one horse you really don’t want to lose because of his extraordinary talent and star potential. As owner Jim Rome tweeted, “He's on the mend. Don't sleep on this dude.” He is the 2-year-old champ after all. Candy Boy certainly flattered the CashCall Futurity result, so let’s hope we get him back in a daily routine right up to the San Felipe, which would seem to be the logical starting off point. Let’s not forget, though, he’s never run on dirt, and despite his pedigree and the likelihood he’ll love it, you never know for sure until they do it. Casse has his priorities straight: “We maybe would have a better shot going to New Orleans with the longer stretch, with speed not holding as well there. But we felt it was better to keep him home for right now. We know he loves Churchill Downs, so we’re trying to get him there happy and healthy. We’re just looking for him to run another good race.” This is a trainer who knows what the Derby trail is all about and realizes these are all just preps to get him to peak on Derby Day. This is a time for learning and moving forward en route to the ultimate goal. Conquest Titan doesn’t need to win these early races, just pick up enough points, while coming home strongly and showing continued improvement. He remains sharp, breezing 5 furlongs in 1:00 flat. The weather has been playing havoc with the Oaklawn track, with four straight days of canceled racing, but there is still plenty of time before the Southwest Stakes on Feb. 17, and he’s built up a solid series of works, and everyone there is in the same boat. The Southwest is going to come up a tough race with a large field and Lukas certainly doesn’t want to gut him first time back. The key with him is how he relaxes early and how he comes home. Once again, he’s proven how talented he is, he’s built a strong foundation, and there is no reason to start back with any monster speed figures. It’s all about settling early and finishing, and he doesn’t have to contend with Bob Baffert, who has won four of the last five runnings. Considering he worked alone and without blinkers and is not a willing worker unless in company and blinkered, his 6-furlong breeze in 1:15 merely served its purpose as a stamina builder and to have him come home fast (:11 4/5) over a deep tiring track. He is eligible for a nonwinners of 2 allowance race scheduled for Feb. 17 that looks like it’s going to attract a number of exciting Derby prospects, so if he runs, that will be a good test for him. If he can build on his Breeders’ Cup Juvenile, in which he finished up fast after a less-than-ideal trip, he should be in good shape moving back into top stakes company. The belief that he can’t get classic distances seems unfounded, considering his grandsire won the Florida Derby, his maternal great-grandsires won the BC Classic and Preakness, and his third dam, Jabot, is a half-sister to the classy stayer Big Spruce, who defeated Forego in the Marlboro Cup, won graded stakes at 1 1/2 miles and 1 5/8 miles, and was second twice in the 1 5/8-mile Canadian International to Secretariat and Dahlia. Jabot, a two-turn stakes winner herself, also is a half sister to Manta, who won the grade I Santa Margarita and Santa Barbara and placed against colts in the 1 1/4-mile Hollywood Gold Cup and 1 1/2-mile Oak Tree Invitational. His maiden win vs. La.-breds earned the co-fastest 2-year-old Thoro-Graph figure, equaling Shared Belief’s fig in the CashCall Futurity. And he still came back and destroyed his competition in the LeComte. He did shy slightly at the sixteenths pole, switching back to his left lead, but other than that it was a professional performance and a big step forward from winning a Louisiana-bred maiden race. Continued his sharp works with a 5-furlong breeze in 1:00 3/5. I’ve been waiting to get him in the Top 12. Love everything about this colt, especially from a visual standpoint. Not only was his Thoro-Graph number in the Cal Cup Derby the top 3-year-old figure this year, along with Cairo Prince’s Holy Bull, he paired up his previous number, winning by huge margins both times, so it would seem he’s for real. He had his first work at his new home, Los Alamitos, at went a sharp half in :48 with jockey Victor Espinoza aboard. All the other reasons why I rate this horse so high were mentioned extensively in last week’s Knocking on the Door. Turned in a sharp 5-furlong breeze in 1:00 4/5 for the Fountain of Youth Stakes, where he’ll try to defeat Top Billing once again and prove he is indeed the better horse. He’s not going to knock you out, but he looks like the type who will out-slug you and is not going to back down from a fight. His Beyer figures have climbed 24 points and 13 points since his first race, and we do know he has the pedigree that shouts distance and steady improvement. With two 1 1/8-mile victories already, he has the foundation and just needs to keep getting faster with each race, as does Top Billing. One thing we know about him is he’s a survivor. When he was a baby he had a reaction to plasma and came very close to dying. It took emergency procedures to get him breathing again and it was touch and go for about 5 minutes until he pulled through. When Frank Brothers, representing Starlight Partners, came to Machmer Hall to inspect the yearlings for the Keeneland sale, he told breeders Carrie and Craig Brogden he was the best horse he saw at the farm, and he backed up that comment by paying $380,000 for him. And Machmer Hall also has had homebreds Vinceremos, who recently won the grade III Sam F. Davis Stakes, and the promising closer Kid Cruz at the farm preparing for the sale. He showed his sharpness, breezing a half in company in :48, second-fastest of 67 works at the distance. This week’s big push horse is the Bob Baffert-trained maiden winner HOPPERTUNITY, although having made his career debut on Jan. 4 must tackle the dreaded Apollo curse, never having started at 2. But this colt could be Baffert’s next Bodemeister, who almost pulled it off two years ago, despite making his debut 12 days after Hoppertunity. In fact, Hoppertunity was entered last Nov. 22, but was a late scratch, so he at least was ready to go back then. In Hoppertunity’s debut, Baffert just needed to get a race in him, and after he broke badly, dropping back to last, he made a good move on the turn before flattening out, finishing fifth. But it was interesting to note that, despite getting beat over seven lengths, he blew by everyone in the gallop-out. In his next start, he broke cleanly and tracked the pace along the inside, waiting patiently for something to open up. He finally found an opening and took over at the three-sixteenths pole. He seemed to be putting in nothing more than a workmanlike performance trying putting the hard-hitting Snuggley Bear away, but put it in another gear with 70 yards to go and quickly opened up to win by three lengths. A sixteenth past the wire he was some 15 lengths in front and had no desire to be pulled up by Martin Garcia. The son of Any Given Saturday is long-backed horse with the look of a stayer, and I love the way he runs through the wire and just now seems to be learning what it’s all about. His dam, Refugee, is by Unaccounted For, best known for his victory in the Whitney and close second to Cigar in the Jockey Club Gold Cup Cup and third to Cigar in the Breeders’ Cup Classic. Most interestingly is Hoppertunity’s third dam, the great Hall of Famer and Filly Triple Crown winner Davona Dale, who produced the French-trained Le Voyageur, third in the Belmont Stakes behind Easy Goer and Sunday Silence. Speaking of SNUGGLEY BEAR, perhaps it is best for trainer Julio Canani to get him as far away from Bob Baffert as possible. In his last four starts (three seconds and a third), he was beaten by Baffert’s Derby contender Indianapolis, then by Baffert’s Derby contender Midnight Hawk, then by Baffert’s Derby contender Bayern, and now by Baffert’s Derby contender Hoppertunity. Has he finally run out of Baffert Derby contenders? And speaking of Baffert, I didn’t want to drop MIDNIGHT HAWK off the Top 12, but the competition for that final spot is very hot and he just didn’t show enough to indicate that he’s a Derby horse. But he is a very good horse who just needs to grow up and mature a little. As for CHITU, he ran a bang-up race, but is still a ways off from being a Derby horse. Every year, Baffert seems to have a horse who keeps surprising and stretching out, and he looks like that horse this year. After displacing grade I winner BOND HOLDER, Champagne third RIDE ON CURLIN, and MEXIKOMA, beaten 3 3/4 lengths in the Breeders’ Cup Juvenile, the next appearance by Derby Future Wager addition MATTERHORN is greatly anticipated. The son of Tapit is inbred 3x4 to Fappiano and was visually impressive winning a tough maiden race going a mile, in which he was between horses almost the entire way, then ran down and out-dueled stablemate HARPOON, who came back to win impressively and then get beat a nose in the Sam F. Davis Stakes. With only one start under his belt, albeit a mile, and not having run for 2 1/2 months, Matterhorn is playing major catch-up, and Todd Pletcher likely is going to have to get three starts in him with no hiccups along the way. Also in the beaten field was the highly regarded TONALIST, who came back and broke his maiden in impressive fashion and also was added to the Future Wager field. There is a lot to like about this colt, especially the way he was forced five wide into the far turn and swept by horses before having to be put to a long drive to put away the Pletcher-trained Global Strike, drawing clear to win by four lengths. Another son of Tapit, he could turn out to be a smart play in the Future Wager at 48-1. And how about getting Candy Boy at 32-1? While Tonalist goes for the Fountain of Youth, there is an allowance race at Gulfstream in the books for Feb. 17, and you can expect several major players to show up there. In addition to Harpoon, Pletcher also has the exciting maiden winner HARTFORD working regularly and looking for a race. Yet another son of Tapit, he, too, has had only one race in his life (going 7 furlongs) and looked like a powerhouse coming home in :12 flat under a hand ride the entire stretch, while drawing off by almost six lengths and then galloping out strong. But like Hoppertunity, he’ll be facing the Apollo curse. 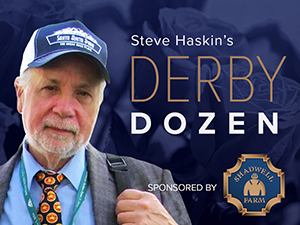 So, it is apparent that we have a number of lightly raced, budding stars waiting to break out, and we can expect some major changes on the Derby Dozen in the next couple of weeks. Speaking of BOND HOLDER, he worked 6 furlongs in 1:12 3/5, followed by 1:12 2/5, followed by 1:12 1/5, so we just could see a much sharper colt than we saw in his last two races. He’s heading for the Risen Star Stakes and should relish that long stretch. Also working for the Risen Star was Delta Jackpot winner RISE UP, who breezed 5 furlongs in 1:01 2/5. The Southwest Stakes Feb. 17 should help clear up the Derby picture at Oaklawn, as a large field is expected, headed by STRONG MANDATE, TAPITURE, BOURBONIZE, RIDE ON CURLIN, TANZANITE CAT, COASTLINE, and LOUIES FLOWER. COMMANDING CURVE, a two-turn maiden winner at Churchill Downs last out, turned in a bullet 5-furlong work in 1:00 2/5 at Fair Grounds, fastest of 64 works at the distance. The son of Master Command, trained by Dallas Stewart, has a win and a close second and third in three starts at Churchill. Several other new faces to watch in the upcoming weeks are MOSLER, trained by Bill Mott, KID CRUZ, and back-to-back winner UNDERTAKER for John Servis. Mosler turned in a super 5-furlong breeze in a bullet 1:00 2/5 at Payson Park, which is a huge work at Payson. WICKED STRONG, a horse I was very high on until his dismal effort in the Holy Bull, breezed a sharp half in :48 at Palm Meadows. His Remsen performance has earned him another shot. Last year’s Futurity winner IN TROUBLE, who also was dropped from the Future Wager, has been training sharply, with a :48 breeze and 1:00 3/5 drill, while the speedy undefeated NO NAY NEVER, a winner in three countries already and a group I winner at Deauville and Group II winner at Royal Ascot, worked a half in :46 3/5 at Gulfstream Feb. 2. Bob Baffert said his exciting San Pedro winner INDIANAPOLIS, likely will start next in the 7-furlong San Vicente Stakes Feb. 16 before finally stretching out to two turns. This fleet-footed colt has the potential to be any kind. But we’ll have to see how far he wants to go. TAMARANDO, who was a clear-cut second behind California Chrome last out, drilled a brisk 5 furlongs in a bullet :59 2/5, fastest of 21 works, while Sham Stakes runner-up KRISTO worked 5 furlongs in :59 1/5. Last week’s Withers Stakes came up strong on Thoro-Graph, with SAMRAAT getting a “1 1/2,” one of the fastest figs earned by a 3-year-old this year, right behind Cairo Prince and California Chrome.